The Leonardo da Vinci Museum in Florence is mainly a technical museum which exhibits replicas of the inventions of the famous painter and technician from the Renaissance period. For people interested in technology, a visit to the small museum is a great experience. Beside the replicas there is also a room with reproductions of the famous paintings of Leonardo da Vinci. A hall of mirrors is also interesting. The entrance fee is 7 Euro for adults. Children under 6 are free. Tickets in advance are available on this website. The exhibition is open in summer (April to October) from 10 am to 7 pm. in winter from 10 am to 6 pm. There is no rest day, only at Christmas (24.12. and 25.12.) the museum is closed. The Leonardo da Vinci Museum Florence is not very big, but there is a lot to see. The largest part of the museum consists of modern wooden replicas of Leonardo’s inventions. Many of the dozens of wooden models are several meters tall. Beside almost every invention is a description in 6 languages, including English and German. In addition to the exhibited innovations by Leonardo da Venci, the machines, such as the armoured car and the aircraft, are particularly popular with many museum visitors. It is a kind of muscle-driven helicopter, which Leonardo da Vinci called „vertical bird flying machine“. Among the highlights are a diving suit, a cannon, a machine gun, boats with in this time unknown propulsion and even the idea of a robot. Leonardo da Vinci (1452 to 1519) was centuries ahead of his time. Even if not all of his inventions worked like the flying machine at that time, many of the Da Vinci machines were reinvented some hundred years later with similar principles. Very interesting for technology fans is also the part of the Leonardo da Vinci Museum that deals with drive technologies. Da Vinci’s ideas and inventions on power transmission are ingenious. He invented several drive systems, including a chain drive similar to a bicycle chain. A completely different section of the exhibition deals with another science by Leonardo da Vinci. He studied the human body (human anatomy). Not badly made is also the room with the self-luminous replicas of the great paintings of Leonardo da Vinci. The highlight is, of course, the Mona Lisa. But also the 10 other paintings are interesting. Nowhere else can you find all the big pictures of Leonardo da Vinci in one room. The originals are scattered in different museums. Many in the Louvre in Paris or in the Uffizi in Florence, about 500 metres away from the Leonardo da Vinci Museum Firenze. Leonardo also examined mirrors and mirror images. In the small mirror room in the museum you are surrounded from all sides by mirrors. No matter in which direction you turn, you see yourself infinitely often from all sides. Also done great. In the entrance area there is a rather well-stocked bookshop where you can find books about Leonardo da Vinci. But you can also find other books, for example travel guides about Florence and children’s books. Some books are also available in German. There are also souvenirs, videos and much more. Although there are no original Leonardo da Vinci exhibits in the museum, the exhibition is very interesting. We were very impressed by Leonardo’s genius, which is well represented in the museum. We now understand much better why many scientists and authors call Leonardo da Vinci the most brilliant man of all time or the man with the highest IQ of all time. Da Vinci not only painted the Mona Lisa, the most famous picture of all time, he was also the greatest inventor of mankind. Perhaps Da Vinci was even the greatest and most intelligent man who ever lived. 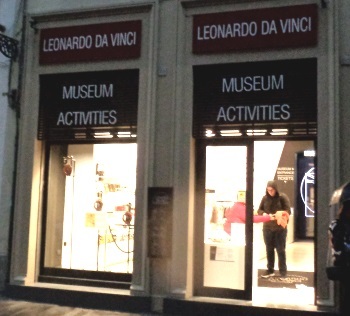 The Da Vinci Museo Firenze is only 100 to 200 meters away from the famous Florence cathedral. You walk around the cathedral on the cathedral square. From there, take the road to the left of the new Cathedral Museum and leave the church (Via dei Servi). Museum address: Via dei Servi 66r, Firenze. Great museums in Vienna (Austria) are the big Natural History Museum Austria and the art museum Leopold and the mumok (modern art).